The iconic company's record value on Wall Street isn't synonymous with the corporate values Americans once took for granted. 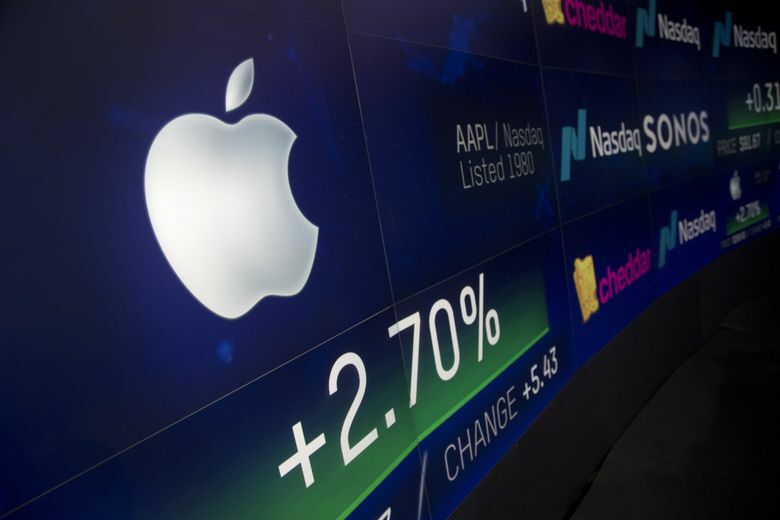 Last week, Apple became the first American company to top $1 trillion in market valuation. This prompted much celebration in the media of the company that brought us the Mac and iPad, and revolutionized the smartphone. Some cautionary context came from a New York Times story that ran in this newspaper this past Sunday. Good luck, some lawmakers, in this new age of laissez-faire. No matter how much you love your iPhone, don’t be fooled. For one thing, the valuation, or market capitalization, is merely the sum of multiplying the total number of outstanding shares by their price on the stock exchange. This doesn’t necessarily coincide with a company’s underlying health or long-term prospects. Worldcom, a huge bundle of hustles, had a market cap of more than $186 billion in 1999 before it collapsed. Nor does the number represent a company’s contribution to the public good. Meanwhile, most wages are stubbornly stagnant. Even with continued steady job growth, the employment-to-population ratio of prime-age adults (25 to 54) remains lower than this point in previous expansions. This is especially true for men. These problems are a reminder that this trillion-dollar marker, or the stock indexes’ highs, aren’t floating all boats. In an era when (perfectly legal) tax avoidance is common in corporate America, Apple was an especially egregious player. It’s unclear whether the GOP corporate tax-rate cuts will change the grifter mentality. In other words, what’s good for Apple, Big Tech, or the stock market isn’t necessarily good for America. As Frank Rich wrote in New York magazine, “In the Digital Century, unlike the preceding American Century, the largest corporations are not admired as sources of jobs, can-do-ism, and tangible goods that might enrich and empower all. Call it the Great Disconnect. One obvious uncoupling is between the fortunes of those who primarily make their living by investments and those who depend on wages. The former have done very well with this bull market. The latter have not. For example, the median income for 25-to 34-year olds, adjusted for inflation, is stuck where it stood in 1977 ($34,000 annually). Median household wealth has yet to rebound from 2008. To be fair, the market also helps sustain the pensions of the diminishing number of Americans fortunate enough to have them, and the inferior 401(k)s. But fewer than 14 percent of households directly owned stock as of 2016. In 1964, the leader in market cap was the old AT&T. It supported nearly 759,000 well-paid, full-time jobs, with generous benefits and pensions. No. 2 was General Motors, with 661,000 similar good jobs. Of course, in that era Wall Street was mostly a stodgy place. People owned stock for the dividends, not for a quick payoff next quarter. In this post-World War II era, the rising fortunes of the wealthy and corporations were connected with gains for most workers. In 1970, employee compensation was 52 percent of gross domestic income. In 2016, the most recent year measured, worker compensation was 43 percent — in recent years it’s been at record lows since measurement began in 1948. But this is not the same as the 1960s corporations. The majority of these are app creators, many of whom can’t really make a good living from that alone, and none receiving health insurance or pensions from the $1 trillion company. Dig deeper and the company reports 80,000 employees, including 1,100 in Washington. Apple doesn’t break out which are the well-paying positions, as opposed to those in retail stores. Seattle hosts an Apple research and development center for machine learning and artificial intelligence. This is common in Big Tech. Facebook has about 30,000 employees. Microsoft lists about 78,000 (including nearly 49,000 in the Puget Sound region). Amazon, with its massive logistical network, employs more than half a million (but few making the money of its 45,000 Seattle workers). Still, Apple is not connected to most communities by its big shoulders of factories (manufacturing is done offshore), but merely by its gadgets. I’ve been using Apple products since the late 1980s, hooked by the intuitive and easy functionality and cool design. (Calm down, I’ve spent plenty on Microsoft software, too.) But the affair is growing stale. Service isn’t what it once was. The Apple Store at University Village is crowded and hard to reach (why no store downtown?). I’m hoping my old iPhone lasts because some features of the new are off-putting. The magic of Steve Jobs is fading, however much Wall Street loves CEO Tim Cook. I’m not prepared to disconnect. But I’m not impressed by a $1 trillion market cap in an America with poorly paid teachers, crumbling infrastructure and dead-end jobs. All the electronic distractions won’t fix that — even if some can help tilt a presidential election.